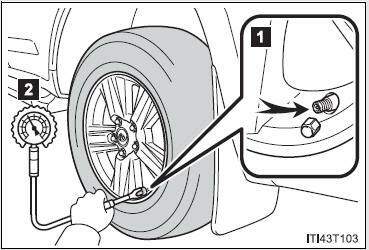 If the tire inflation pressure is not within the recommended levels, adjust tire pressure. Make sure to maintain the proper tire inflation pressure. Tire inflation pressure should be checked at least once per month. However, Toyota recommends that tire inflation pressure be checked once every two weeks. Do not bleed or reduce tire inflation pressure after driving. It is normal for the tire inflation pressure to be higher after driving.